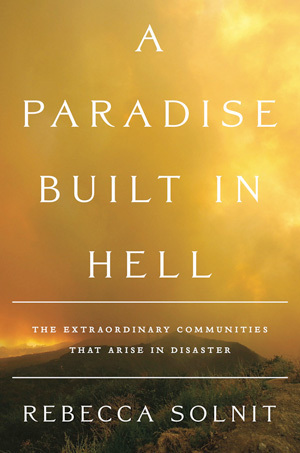 Last night a lively group gathered at the Ukiah Library for a discussion of Rebecca Solnit‘s book, A Paradise Built in Hell: The Extraordinary Communities that Arise in Disaster. Led by Anne Shirako, this was the second of three events focused on the democracy of community. One of the main topics discussed was that of chaos vs. cooperation during times of disaster. When the term “anarchy” was mentioned, the group began to consider the true meaning of the word and its origins. Branch Librarian, Eliza Wingate, promptly solved this query with the ideal source: a dictionary! Lawlessness or political and social disorder due to the absence of Government control. I left the discussion not only contemplating how I hoped I would act following a natural disaster, but also with a reminder to consider the origins of words when deep in debate. Don’t have a dictionary at home and can’t make it to the library? Dictionary.com is a great, free online resource that also has apps for multiple smart phones, e-readers, and tablets (http://dictionary.reference.com/). If you couldn’t attend last night’s event, or wish to continue the dialogue, please feel welcome to do so in the comments section. The next discussion on this topic shall be August 14th at the Ukiah Library at 7:00pm. Sponsored by the Mendocino County Library. This program is part of a grant from Cal Humanities, “Searching for Democracy”, California READS and in partnership with California Center for the Book. Though this is my final year in the SJSU SLIS program, today marks the start of the journey for all new students. As a LIBR 203 Peer Mentor I am excited to share this time with you all! 10 years after graduating with my BA in English, I am finally starting graduate school. Returning to college after a few years of adult life behind me, and settled into a rent-controlled apartment, I opted for an online graduate school program via San Jose State University. Regardless of where my life’s path takes me, I can take my education with me… that is, at least until I decide to go for a PhD. I’ll admit, I was a bit skeptical at first. Sally Struthers commercials kept flashing through my head, as did the Owl Correspondence School song from Mr. Roger’s Neighborhood. However, now that I’ve got a fancy new headset and look like the Time-Life operator I’m realizing that there’s a difference between correspondence courses and distance learning. I’m actually interacting more with faculty and fellow students in this environment than I did in my undergraduate studies. Granted, back then I was also experiencing my first taste of adult freedom and might have valued socializing over learning. For the first semester, I am taking the basics (in addition to the pre-requisite “Online Social Networking: Technology and Tools”): Information & Society, Information Retrieval, and Information Organizations & Management. Here’s hoping that I still remember how to write an academic paper!